Citation Information: JCI Insight. 2018;3(5):e90163. https://doi.org/10.1172/jci.insight.90163. Periplakin is a component of the desmosomes that acts as a cytolinker between intermediate filament scaffolding and the desmosomal plaque. Periplakin is strongly expressed by epithelial cells in the lung and is a target antigen for autoimmunity in idiopathic pulmonary fibrosis. The aim of this study was to determine the role of periplakin during lung injury and remodeling in a mouse model of lung fibrosis induced by bleomycin. We found that periplakin expression was downregulated in the whole lung and in alveolar epithelial cells following bleomycin-induced injury. Deletion of the Ppl gene in mice improved survival and reduced lung fibrosis development after bleomycin-induced injury. Notably, Ppl deletion promoted an antiinflammatory alveolar environment linked to profound changes in type 2 alveolar epithelial cells, including overexpression of antiinflammatory cytokines, decreased expression of profibrotic mediators, and altered cell signaling with a reduced response to TGF-β1. These results identify periplakin as a previously unidentified regulator of the response to injury in the lung. Citation Information: JCI Insight. 2018;3(5):e93994. https://doi.org/10.1172/jci.insight.93994. Premature infants are at high risk for developing bronchopulmonary dysplasia (BPD), characterized by chronic inflammation and inhibition of lung development, which we have recently identified as being modulated by microRNAs (miRNAs) and alterations in the airway microbiome. Exosomes and exosomal miRNAs may regulate cell differentiation and tissue and organ development. We discovered that tracheal aspirates from infants with severe BPD had increased numbers of, but smaller, exosomes compared with term controls. Similarly, bronchoalveolar lavage fluid from hyperoxia-exposed mice (an animal model of BPD) and supernatants from hyperoxia-exposed human bronchial epithelial cells (in vitro model of BPD) had increased exosomes compared with air controls. Next, in a prospective cohort study of tracheal aspirates obtained at birth from extremely preterm infants, utilizing independent discovery and validation cohorts, we identified unbiased exosomal miRNA signatures predictive of severe BPD. The strongest signal of reduced miR-876-3p in BPD-susceptible compared with BPD-resistant infants was confirmed in the animal model and in vitro models of BPD. In addition, based on our recent discovery of increased Proteobacteria in the airway microbiome being associated with BPD, we developed potentially novel in vivo and in vitro models for BPD combining Proteobacterial LPS and hyperoxia exposure. Addition of LPS led to a larger reduction in exosomal miR 876-3p in both hyperoxia and normoxia compared with hyperoxia alone, thus indicating a potential mechanism by which alterations in microbiota can suppress miR 876-3p. Gain of function of miR 876-3p improved the alveolar architecture in the in vivo BPD model, demonstrating a causal link between miR 876-3p and BPD. In summary, we provide evidence for the strong predictive biomarker potential of miR 876-3p in severe BPD. We also provide insights on the pathogenesis of neonatal lung disease, as modulated by hyperoxia and microbial product–induced changes in exosomal miRNA 876-3p, which could be targeted for future therapeutic development. Citation Information: JCI Insight. 2018;3(5):e95874. https://doi.org/10.1172/jci.insight.95874. Autosomal dominant polycystic kidney disease (ADPKD) can be caused by mutations in the PKD1 or PKD2 genes. The PKD1 gene product is a Wnt cell-surface receptor. We previously showed that a lack of the PKD2 gene product, PC2, increases β-catenin signaling in mouse embryonic fibroblasts, kidney renal epithelia, and isolated renal collecting duct cells. However, it remains unclear whether β-catenin signaling plays a role in polycystic kidney disease phenotypes or if a Wnt inhibitor can halt cyst formation in ADPKD disease models. Here, using genetic and pharmacologic approaches, we demonstrated that the elevated β-catenin signaling caused by PC2 deficiency contributes significantly to disease phenotypes in a mouse ortholog of human ADPKD. Pharmacologically inhibiting β-catenin stability or the production of mature Wnt protein, or genetically reducing the expression of Ctnnb1 (which encodes β-catenin), suppressed the formation of renal cysts, improved renal function, and extended survival in ADPKD mice. Our study clearly demonstrates the importance of β-catenin signaling in disease phenotypes associated with Pkd2 mutation. It also describes the effects of two Wnt inhibitors, XAV939 and LGK974, on various Wnt signaling targets as a potential therapeutic modality for ADPKD, for which there is currently no effective therapy. Citation Information: JCI Insight. 2018;3(5):e96151. https://doi.org/10.1172/jci.insight.96151. Excess lipid accumulation is an early signature of nonalcoholic fatty liver disease (NAFLD). Although liver receptor homolog 1 (LRH-1) (encoded by NR5A2) is suppressed in human NAFLD, evidence linking this phospholipid-bound nuclear receptor to hepatic lipid metabolism is lacking. Here, we report an essential role for LRH-1 in hepatic lipid storage and phospholipid composition based on an acute hepatic KO of LRH-1 in adult mice (LRH-1AAV8-Cre mice). Indeed, LRH-1–deficient hepatocytes exhibited large cytosolic lipid droplets and increased triglycerides (TGs). LRH-1–deficient mice fed high-fat diet displayed macrovesicular steatosis, liver injury, and glucose intolerance, all of which were reversed or improved by expressing wild-type human LRH-1. While hepatic lipid synthesis decreased and lipid export remained unchanged in mutants, elevated circulating free fatty acid helped explain the lipid imbalance in LRH-1AAV8-Cre mice. Lipidomic and genomic analyses revealed that loss of LRH-1 disrupts hepatic phospholipid composition, leading to lowered arachidonoyl (AA) phospholipids due to repression of Elovl5 and Fads2, two critical genes in AA biosynthesis. Our findings reveal a role for the phospholipid sensor LRH-1 in maintaining adequate pools of hepatic AA phospholipids, further supporting the idea that phospholipid diversity is an important contributor to healthy hepatic lipid storage. Citation Information: JCI Insight. 2018;3(5):e96322. https://doi.org/10.1172/jci.insight.96322. Inflammatory bowel disease (IBD) is associated with enhanced levels of the IL-1 family cytokines IL-1β and IL-18, which are activated by the Nlrp3 inflammasome. Here, we investigated the role of inflammasome-driven cytokine release on T cell polarization and DC differentiation in steady state and T cell transfer colitis. In vitro and in vivo data showed that IL-1β induces Th17 polarization and increases GM‑CSF production by T cells. Reduced IL-1β levels in Nlrp3–/– mice correlated with enhanced FLT3L levels and increased frequency of tolerogenic CD103+ DC. In the T cell transfer colitis model, Nlrp3 deficiency resulted in lower IL‑1β levels, reduced Th17 immunity, and less severe colitis. Unaltered IL-18 levels in both mouse strains pointed toward Nlrp3-independent processing. Importantly, cohousing revealed that the gut microbiome had no impact on the observed Nlrp3–/– phenotype. This study demonstrates that NLRP3 acts as a molecular switch of intestinal homeostasis by shifting local immune cells toward an inflammatory phenotype via IL-1β. Citation Information: JCI Insight. 2018;3(5):e96795. https://doi.org/10.1172/jci.insight.96795. B cells play a central role in systemic lupus erythematosus (SLE) pathophysiology but dysregulated pathways leading to a break in B cell tolerance remain unclear. Since Toll-like receptor 9 (TLR9) favors the elimination of autoreactive B cells in the periphery, we assessed TLR9 function in SLE by analyzing the responses of B cells and plasmacytoid dendritic cells (pDCs) isolated from healthy donors and patients after stimulation with CpG, a TLR9 agonist. We found that SLE B cells from patients without hydroxychloroquine treatment displayed defective in vitro TLR9 responses, as illustrated by the impaired upregulation of B cell activation molecules and the diminished production of various cytokines including antiinflammatory IL-10. In agreement with CD19 controlling TLR9 responses in B cells, decreased expression of the CD19/CD21 complex on SLE B cells was detected as early as the transitional B cell stage. In contrast, TLR7 function was preserved in SLE B cells, whereas pDCs from SLE patients properly responded to TLR9 stimulation, thereby revealing that impaired TLR9 function in SLE was restricted to B cells. We conclude that abnormal CD19 expression and TLR9 tolerogenic function in SLE B cells may contribute to the break of B cell tolerance in these patients. Citation Information: JCI Insight. 2018;3(5):e97011. https://doi.org/10.1172/jci.insight.97011. Graft-versus-host disease (GVHD) is a life-threatening complication of allogeneic stem cell transplantation induced by the influx of donor-derived effector T cells (TE) into peripheral tissues. Current treatment strategies rely on targeting systemic T cells; however, the precise location and nature of instructions that program TE to become pathogenic and trigger injury are unknown. We therefore used weighted gene coexpression network analysis to construct an unbiased spatial map of TE differentiation during the evolution of GVHD and identified wide variation in effector programs in mice and humans according to location. Idiosyncrasy of effector programming in affected organs did not result from variation in T cell receptor repertoire or the selection of optimally activated TE. Instead, TE were reprogrammed by tissue-autonomous mechanisms in target organs for site-specific proinflammatory functions that were highly divergent from those primed in lymph nodes. In the skin, we combined the correlation-based network with a module-based differential expression analysis and showed that Langerhans cells provided in situ instructions for a Notch-dependent T cell gene cluster critical for triggering local injury. Thus, the principal determinant of TE pathogenicity in GVHD is the final destination, highlighting the need for target organ–specific approaches to block immunopathology while avoiding global immune suppression. Citation Information: JCI Insight. 2018;3(5):e97493. https://doi.org/10.1172/jci.insight.97493. Loss-of-function mutations in genes encoding contractile proteins have been observed in thoracic aortic aneurysms (TAA). To gain insight into the contribution of contractile protein deficiency in the pathogenesis of TAA, we examined human aneurysm samples. We found multiple contractile gene products deficient in TAA samples, and in particular, expression of SM22α was inversely correlated with aneurysm size. SM22α-deficient mice demonstrated pregnancy-induced aortic dissection, and SM22α deficiency worsened aortic aneurysm in Fbn1C1039G/+ (Marfan) mice, validating this gene product as a TAA effector. We found that repression of SM22α was enforced by increased activity of the methyltransferase EZH2. TGF-β effectors such as SMAD3 were excluded from binding SM22α-encoding chromatin (TAGLN) in TAA samples, while treatment with the EZH2 inhibitor GSK343 improved cytoskeletal architecture and restored SM22α expression. Finally, inhibition of EZH2 improved aortic performance in Fbn1C1039G/+ mice, in association with restoration of contractile protein expression (including SM22α). Together, these data inform our understanding of contractile protein deficiency in TAA and support the pursuit of chromatin modifying factors as therapeutic targets in aortic disease. Citation Information: JCI Insight. 2018;3(5):e98212. https://doi.org/10.1172/jci.insight.98212. Autoimmune-mediated destruction of pancreatic islet β cells results in type 1 diabetes (T1D). Serum islet autoantibodies usually develop in genetically susceptible individuals in early childhood before T1D onset, with multiple islet autoantibodies predicting diabetes development. However, most at-risk children remain islet-antibody negative, and no test currently identifies those likely to seroconvert. We sought a genomic signature predicting seroconversion risk by integrating longitudinal peripheral blood gene expression profiles collected in high-risk children included in the BABYDIET and DIPP cohorts, of whom 50 seroconverted. Subjects were followed for 10 years to determine time of seroconversion. Any cohort effect and the time of seroconversion were corrected to uncover genes differentially expressed (DE) in seroconverting children. Gene expression signatures associated with seroconversion were evident during the first year of life, with 67 DE genes identified in seroconverting children relative to those remaining antibody negative. These genes contribute to T cell–, DC-, and B cell–related immune responses. Near-birth expression of ADCY9, PTCH1, MEX3B, IL15RA, ZNF714, TENM1, and PLEKHA5, along with HLA risk score predicted seroconversion (AUC 0.85). The ubiquitin-proteasome pathway linked DE genes and T1D susceptibility genes. Therefore, a gene expression signature in infancy predicts risk of seroconversion. Ubiquitination may play a mechanistic role in diabetes progression. Citation Information: JCI Insight. 2018;3(5):e98522. https://doi.org/10.1172/jci.insight.98522. Neuregulins (NRGs) are emerging as an important family of signaling ligands that regulate glucose and lipid homeostasis. NRG1 lowers blood glucose levels in obese mice, whereas the brown fat–enriched secreted factor NRG4 protects mice from high-fat diet–induced insulin resistance and hepatic steatosis. However, the therapeutic potential of NRGs remains elusive, given the poor plasma half-life of the native ligands. Here, we engineered a fusion protein using human NRG1 and the Fc domain of human IgG1 (NRG1-Fc) that exhibited extended half-life in circulation and improved potency in receptor signaling. We evaluated its efficacy in improving metabolic parameters and dissected the mechanisms of action. NRG1-Fc treatment triggered potent AKT activation in the liver, lowered blood glucose, improved insulin sensitivity, and suppressed food intake in obese mice. NRG1-Fc acted as a potent secretagogue for the metabolic hormone FGF21; however, the latter was largely dispensable for its metabolic effects. NRG1-Fc directly targeted the hypothalamic POMC neurons to promote membrane depolarization and increase firing rate. Together, NRG1-Fc exhibits improved pharmacokinetic properties and exerts metabolic benefits through dual inhibition of hepatic gluconeogenesis and caloric intake. Citation Information: JCI Insight. 2018;3(5):e98962. https://doi.org/10.1172/jci.insight.98962. Allogeneic hematopoietic cell transplantation (alloHCT) is a potentially curative treatment for myelodysplastic syndromes (MDS), but patients who relapse after transplant have poor outcomes. In order to understand the contribution of tumor clonal evolution to disease progression,we applied exome and error-corrected targeted sequencing coupled with copy number analysis to comprehensively define changes in the clonal architecture of MDS in response to therapy using 51 serially acquired tumor samples from 9 patients who progressed after an alloHCT. We show that small subclones before alloHCT can drive progression after alloHCT. Notably, at least one subclone expanded or emerged at progression in all patients. Newly acquired structural variants (SVs) were present in an emergent/expanding subclone in 8 of 9 patients at progression, implicating the acquisition of SVs as important late subclonal progression events. In addition, pretransplant therapy with azacitidine likely influenced the mutation spectrum and evolution of emergent subclones after alloHCT. Although subclone evolution is common, founding clone mutations are always present at progression and could be detected in the bone marrow as early as 30 and/or 100 days after alloHCT in 6 of 8 (75%) patients, often prior to clinical progression. In conclusion, MDS progression after alloHCT is characterized by subclonal expansion and evolution, which can be influenced by pretransplant therapy. Citation Information: JCI Insight. 2018;3(5):e99453. 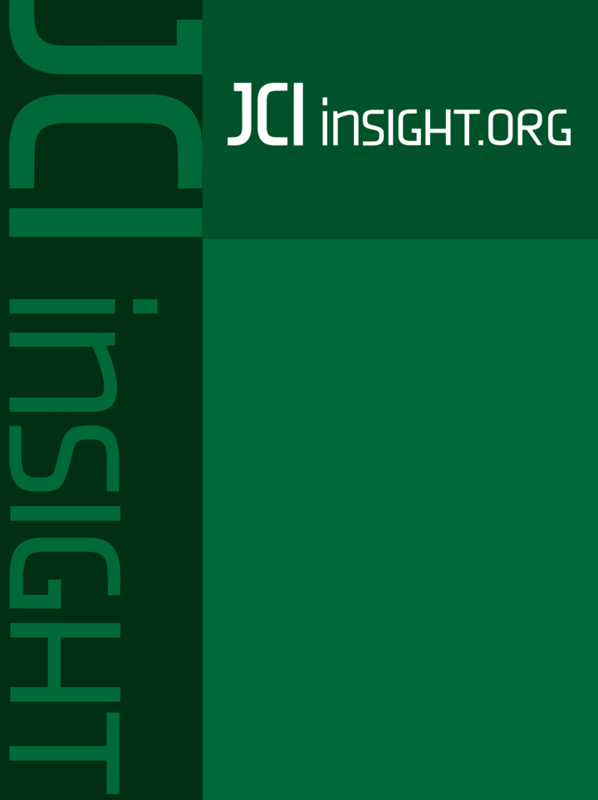 https://doi.org/10.1172/jci.insight.99453. Current obesity interventions suffer from lack of durable effects and undesirable complications. Fumagillin, an inhibitor of methionine aminopeptidase-2, causes weight loss by reducing food intake, but with effects on weight that are superior to pair-feeding. Here, we show that feeding of rats on a high-fat diet supplemented with fumagillin (HF/FG) suppresses the aggressive feeding observed in pair-fed controls (HF/PF) and alters expression of circadian genes relative to the HF/PF group. Multiple indices of reduced energy expenditure are observed in HF/FG but not HF/PF rats. HF/FG rats also exhibit changes in gut hormones linked to food intake, increased energy harvest by gut microbiota, and caloric spilling in the urine. Studies in gnotobiotic mice reveal that effects of fumagillin on energy expenditure but not feeding behavior may be mediated by the gut microbiota. In sum, fumagillin engages weight loss–inducing behavioral and physiologic circuits distinct from those activated by simple caloric restriction. Citation Information: JCI Insight. 2018;3(5):e97018. https://doi.org/10.1172/jci.insight.97018. Major advances in donor identification, antigen probe design, and experimental methods to clone pathogen-specific antibodies have led to an exponential growth in the number of newly characterized broadly neutralizing antibodies (bnAbs) that recognize the HIV-1 envelope glycoprotein. Characterization of these bnAbs has defined new epitopes and novel modes of recognition that can result in potent neutralization of HIV-1. However, the translation of envelope recognition profiles in biophysical assays into an understanding of in vivo activity has lagged behind, and identification of subjects and mAbs with potent antiviral activity has remained reliant on empirical evaluation of neutralization potency and breadth. To begin to address this discrepancy between recombinant protein recognition and virus neutralization, we studied the fine epitope specificity of a panel of CD4-binding site (CD4bs) antibodies to define the molecular recognition features of functionally potent humoral responses targeting the HIV-1 envelope site bound by CD4. Whereas previous studies have used neutralization data and machine-learning methods to provide epitope maps, here, this approach was reversed, demonstrating that simple binding assays of fine epitope specificity can prospectively identify broadly neutralizing CD4bs–specific mAbs. Building on this result, we show that epitope mapping and prediction of neutralization breadth can also be accomplished in the assessment of polyclonal serum responses. Thus, this study identifies a set of CD4bs bnAb signature amino acid residues and demonstrates that sensitivity to mutations at signature positions is sufficient to predict neutralization breadth of polyclonal sera with a high degree of accuracy across cohorts and across clades.